The Marvel Minimates cycle turns, and another themed series comes our way. Last time was a bit of a jumble, mixing X-Men with Marvel Universe characters - their common thread was that they were (almost) all movie characters. Now that they've reached double digits, however, the Minimates are back to the wall-crawling world of Spider-Man. Silver Sable is the leader of the Wild Pack, a mercenary group founded by her father to hunt down Nazi war criminals. Headquartered in the tiny Eastern European country of Symkaria, these days the Wild Pack works for anyone who can pay the right price - in fact, the revenue generated by Silver Sable International is the cornerstone of the Symkarian economy. Fun fact: Symkaria shares a border with one of Marvel's other fictional countries, Latveria: homeland of Dr. Doom. The two countries have decent diplomatic relations, thanks mainly to Doom's respect for Silver Sable. The two of them have a standing annual dinner date, in which she hounds him about giving up his life of evil, and he pledges to not invade Symkaria for another year. Awww! Silver's costume is really nicely done. The body isn't just plain gray, which would have been the easy way out: Art Asylum painted her silver with white highlights. On her biceps, thigh and belt are painted several of her distinctive weighted throwing blades. Silver's bright white hair is a repaint of the piece that came with New X-Men Jean Grey, and she's got a silver version of Punisher's rifle. Even her face is more detailed than average: she's got a silver headband, a wireless headset earpiece and a slight smile on her lips. In this set, you get to choose whether Silver has an ally or an enemy: she's paired with old-school Spidey foe Sandman. Of course, Sable was one of the first people to really give William Baker a chance to atone for his past, by hiring him for the Wild Pack. 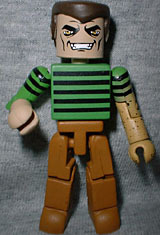 Sandman is a great character, and has always been overlooked for toys in favor of guys like Green Goblin and Venom - as you can tell, it took ten series of Minimates before we got a version of him. His legs and feet are the same brown color, possibly to suggest that they're in a transitional state between sand and skin. His right arm is human, but his left is slightly sandy yellow with dark brown speckles. He's in his stripey green shirt, which is a must for the character, even if it's not done very well: The stripes are only on the front and back, not the shoulders or sides. His left arm is shifting to sand, with a subtle fade from green to yellow, so having the stripes end makes sense. But the stripes still end at the bicep on his human arm, rather than continuing down the sleeve. This isn't as big an oversight as the terrible job Art Asylum did on the Bullseye Minimate, but it's still pretty unimpressive. Sandman's face is nice, with a smirking grin and a few well-placed wrinkles - and in a nice bit of detail, his eyes are the same sandy yellow as his arm. His hair piece is the right shape, all angular, but it doesn't have the horizontal cornrows that Sandman shared with Green Goblin. 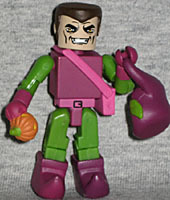 Oh well - put this head on your GG figure and you can have an unmasked Norman Osborn. Sandman includes one accessory, which will be new to everyone except the 500 people who got Tower Records' Thing/Super Skrull exclusive. AA reused the Super Skrull's extended rock arm and painted it yellow to duplicate Sandman's powers. All the Minimates share the same body with different paint decos, and they all move at the same 14 points: neck, waist, shoulders, elbows, wrists, hips, knees and ankles. The feet of these two figures have holes in the bottom that make them compatible with the C3 Minimate sets, but they don't have the pegs in their hair pieces to help hold them in place - either Art Asylum has given up the idea, or these pieces were designed before the switch. The plastic used on these Minimates seems a bit softer than previous series, but that might just be my imagination. The elbows don't seem to hold up as well when you're turning the figures' wrists, and Sable's knees seem a bit floppier than usual. Still, the representations of the characters are very good - but you can't help thinking that with just a little more effort, they could have been excellent. What's your favorite fictional city or country? Tell us on our message board, The Loafing Lounge.